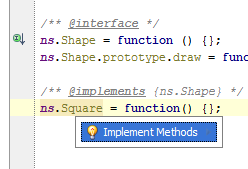 When not all methods from interface are implemented, IDE will warn you about it and suggest to implement methods. Symbols from base interface will go to the completion list even if they are not implemented in a subclass (or IDE doesn’t see them to be implemented). Also @enum, @override, @inheritDoc, @property, @lends, @constructs, @mixin and @mixes are supported now and completion, documentation lookup and parameter info take them into consideration. You can already try all of described functionality in the latest EAP, so don’t hesitate to download it. Bug reports and suggestions are welcomed in our issue tracker. 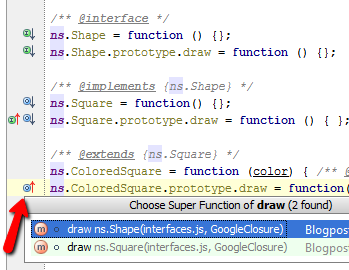 Coming soon: enhanced Google Closure types syntax. At last this feature ist implemented! Nice work! Thanks all of you for kind words! If you are still encountering any issues, please report them, so we’ll fix them before release. Well hot damn. That is just awesome! We use CC here, and getting official support for it in Storm is just awesome! Are there plans to implement the closure compiler type checking (e.g. error when calling a function that expects an int param with a string param instead)? It works sometimes. I’m having difficultly coming up with a reasonable-sized test case. Will this work with loaded files from require.js? 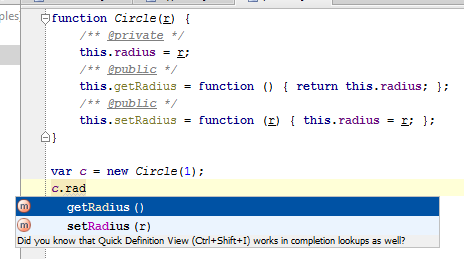 Will this be included in IntelliJ also? Yes, you can already explore it in the latest IDEA EAP. 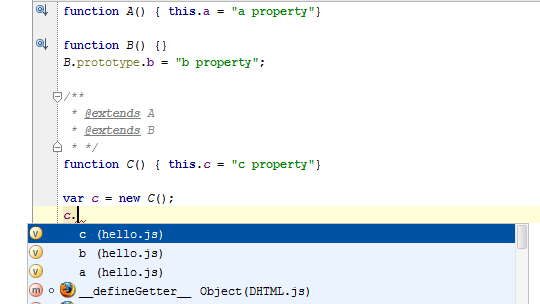 I’m finding it really useful to mark up my code with the @see tag as a way to associate related classes and methods and navigate between them using Ctrl+Click. What other useful tags are now supported? I love this new feature! Don't subscribe All Replies to my comments Optionally, subscribe to email notifications about follow-up comments.